Design with Vinyl is a company that sells all different vinyl decals for walls. I have a few vinyl wall decals up in my current home and contacted this company to review some of their decals for my new home. Since we do not move in for a couple of months, I just chose items that I knew that I wanted to put up. I chose the 1st quote above to go in my family room or upstairs somewhere. 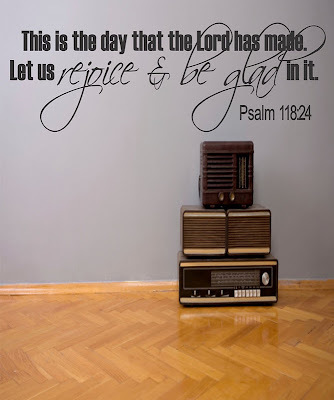 I love the cursive handwriting and it is a great bible quote. For the below quote, I chose that to go somewhere in my entryway. 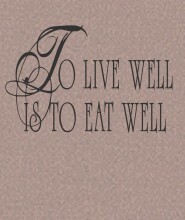 For the "To Live Well is to Eat Well" quote, that will go in a little eating room right off the kitchen. Finally, the last quote which is the laundry room quote will go in my laundry room. Since I could not actually hang these right now, I just took them out of the tube that they were sent in and started to peel the letters off the paper to check the quality. The removable vinyl lettering seems to be a very nice quality and the colors are bold and nice. One of the major things that stuck out to my about Design with Vinyl is that they are much more affordable than other vinyl design companies. For example, most of their decals are around $10-20 and other companies are often more like $50. If I were to need more vinyl decals for my home, I would definitely shop with Design with Vinyl for their affordable prices and great quality. **Also, check out their Facebook and Twitter pages! Disclaimer: I was sent these vinyl decals for my review on The Nutritionist Reviews.. All opinions are my own. I was not given any compensation. I have a vinyl quite that I have yet to put up-I really need to get on that, too! !